This is a stunning vintage ride on car with a high attention to detail and lots of fab features that kids will love. It runs on (2 x 6) 12 volt, twin motor, rechargeable battery and has the added feature of a parental remote control which means you can give your kid the ride of their life whist ensuring they don’t go bump into your garden wall at the same time. If you have a batman fan at home this could possibly be their ultimate Christmas gift for 2013. Take their role play adventures one gigantic step further by getting them their very own Batmobile. If your child is more of a Michael Shoemacher than a batman, then this stunning red Ferrari is one that’s going to make their F1 dreams come true. It will probably also make dad very jealous. This amazing looking electric kids car is a fully licensed Ferrari F12 Berlinetta which, like the Mercedes above, also comes with parental remote controls, making it fun for and safe your child. The Ferrari is a well constructed ride-on with easy assembly. The body for this model is vacuum formed, then painted with real car paint, to give a superb finish. Your child will feel like they are in a real car, with realistic looking accessories and car body. It also comes with working lights and an MP3 plug-in facility – just connect your iPod or mp3 player! Features include: working lights, a seat belt for additional safety, 2 forward speeds and 1 reverse speed, top speed 4km/h, realistic key ignition start. Always fantastically stylish and fun, the Mini Cooper is a true design classic. This version runs on a 12V +2 motors rechargeable battery and comes with parental remote control, mp3 input, battery capacity indicator, soft leather seat to make your kids feel comfortable, 2 music buttons, play engine start-up sounds and many different music tones ( a volume control for parents!) and flashing colour lights. It also has remote and pedal function switch. It’s available in 3 colours, red, blue and pink and is made from toughened, durable plastic with a high gloss realistic finish. Baghera are a fantastic French company and probably make the best designed cars in France, real ones included – sorry Citroen. 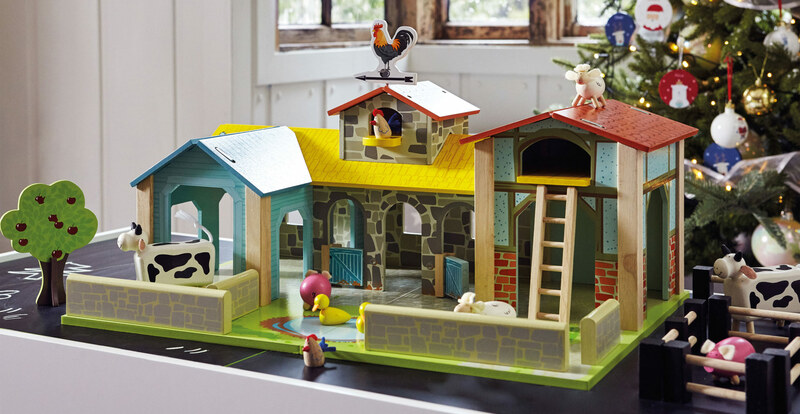 These are truly classic kids toys, exceptionally well made with robust materials and real chic retro designs. Just like the Racer above, the Chocolate is another beautifully crafted well designed ride on toy. I particularly like it because the headlights make it look like one of those cute cartoon character cars that kids love. Again, it comes with a padded seat, metal body, rubber tyres, chrome radiator grille and horn. It’s easy to ride and steer both inside and outside. Slightly larger then the Racer it measures L 72 cm; W 27 cm; H 37 cm and has a seat height of 26 cm. I was looking to find a Chitty Chitty Bang Bang and was very surprised not to find one, however, here is the next best thing, another metal bodied car, this time manufactured by a company called Great Gizmos that produces a wide range of early 20th Century looking vintage toy cars. As you can see, there is a high attention to detail, both with the body work and with features like the wind-up starter at the front, traditional front lights, old-fashioned radiator grille and mock fold up roof at the rear. Truly Scrumptious would have loved this. Not found what you are looking for? Then try here for lots more ride ons. If you are looking for beautiful, high quality, personalised Christmas gifts for babies and young children then we may have just found the perfect place for you. 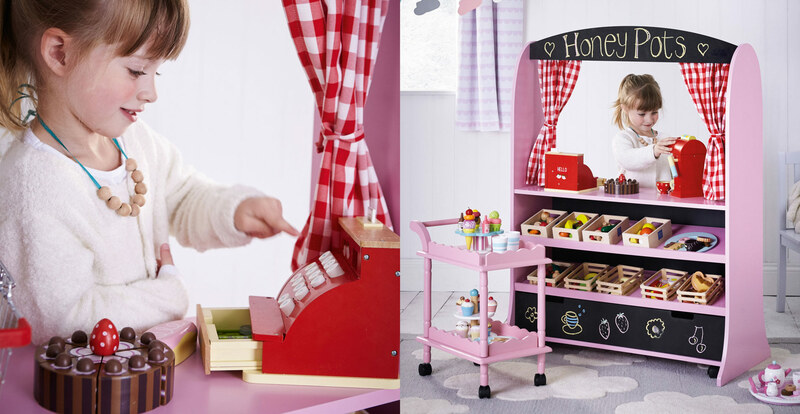 Whether you are looking for clothing and shoes, presents, Christmas decorations, Christmas stockings and sacks or even toys and books, you can get them all from the wonderful My 1st Years shop. My 1st Years have a good selection of personalised Christmas stocking and sacks, all very reasonable priced. 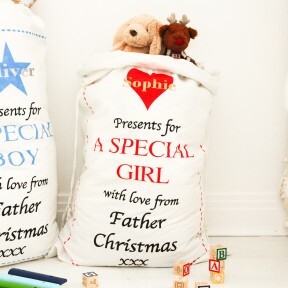 The sack shown measures 55cm by 88cm and is made from strong material printed with the words,’ Presents for a Special Girl with love from Father Christmas.’ It has a love heart at the top onto which the child’s name can be printed. The printing of the text can be up to 15 characters, which is suitable for most children. See our review of personalised Christmas sacks and stockings from another supplier. We just love the idea of personalised toys and this fabulous wooden bike is just awesome. It’s painted in bright colours and with natural finish wheels and handlebars and has rubber wheels covering to imitate a real tyre. The bike measures 55cm high and 80cm in length. Your child’s name is beautifully personalised on the sides with space enough for 9 characters. The bike arrives flat-packed for you to assemble before the big day. A pink version is also available for girls. 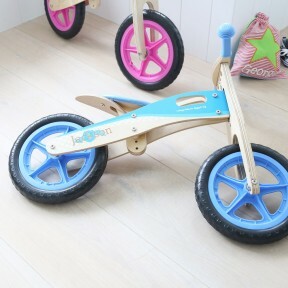 Besides the bike, other wooden toys include a rocking horse, a painted guitar a drum, a xylophone and an abacus, all painted in similar colours to the trike. 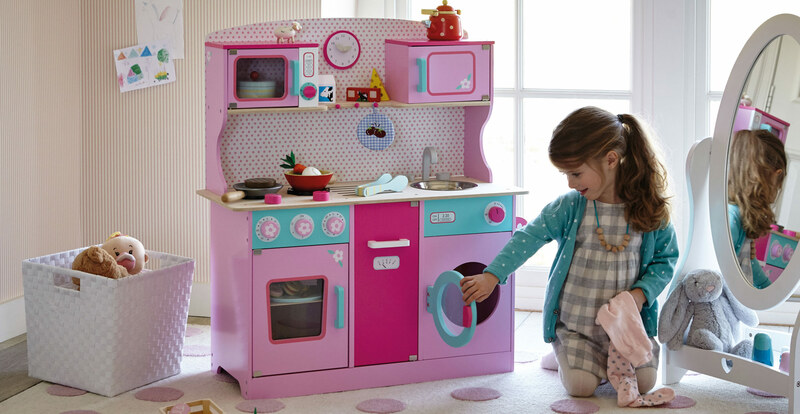 There are also rag dolls, cooking outfits and baking sets for boys and girls, as well as other gorgeous items. There’s a lovely collection of cuddly toys for sale at My 1st Years which are perfect gifts for babies and younger children. Measuring about 25cm high, these are super soft, wipe clean cuddlies made from polyester, with the name of the child embroidered on the teddy’s clothing. You can choose from teddy bears, puppy dogs, reindeer, a long-eared rabbit and even an elephant. If you are looking for super cute Christmas clothing for your baby or toddler, then you have to check out the goodies on offer at My 1st years. We love this Christmas bauble sleep suit the words “My First Christmas” printed above the baby’s name.Made from 100% lovely, soft cotton with snap fastenings for super easy changing. Other clothes include: sleep suits, dressing gowns, onesies, pyjamas, shoes, sleeping bags and bibs. If you are looking for the ideal keepsake which children can treasure for a long time, then a personalised Christmas book is a brilliant option. We really like this ‘Your Letter To Santa’ book, where the name of the child is printed twice on the cover,and on every page in the book. 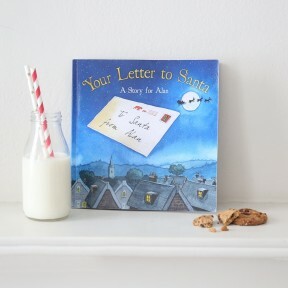 This wonderful hardback book with fantastic water colour illustrations follows your child’s Christmas letter on it’s journey to Santa and then follows the presents on their way to your child. There is a small range of other personalised books to choose from. No Christmas would be complete without beautiful decorations and My 1st Years have a great collection to choose from here, though not all of these are personalised. They include unusual and unique baubles, angels, garlands and various other Christmas trinkets to add that extra sparkle to your festive cheers. We particularly like the personalised owl advent calendar, made out of fabric. 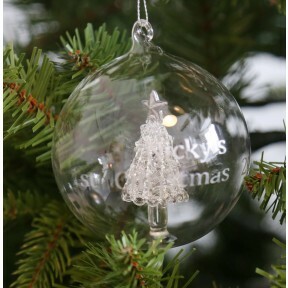 One personalised gift that really looks good is the glass First Christmas bauble shown in the picture. Featuring the name of your child and the year of their first Christmas, this is a souvenir they can keep and bring out year after year. Here’s my 10 best ever family Christmas movies. I’ve chosen them because I think they are films the whole family will enjoy and which perfectly capture the festive feeling. Some are obviously for families with younger children and some are for families with older children, so you’ll need to see the trailer if you want to be sure they are something your own kids would be interested in. They are in no particular order of preference. Hope you enjoy my selection. If you think there are other good ones suitable for families, leave a comment and let us know. This is the heart-warming and magical story of George Bailey who, one Christmas Eve, wishes he had never been born and has his wish granted by an angel. He spends the film being shown how the world would be different if he had never existed and finds out what good things he has actually done. Eventually he comes to realize just what a wonderful life he has – just in time for Christmas. A Wonderful Life is one of the great Christmas films and if you haven’t watched it with your family yet, it’s time you did. Not really for toddlers, though. There are several really good versions of Charles Dickens’ famous book but for me, the two outstanding ones are 1951’s Scrooge starring Alastair Sim and the Jim Carey’s 2009 version made by Disney. Overall, my favourite is the latter. The animation is amazing and brings both the characters and the setting perfectly to life. If you can watch it in 3D then do so – it’s even more fabulous. However, even in 2D, it’s a superb version and Jim Carey’s portrayal of Scrooge is just as good as Sim’s. What I also like about this version is that they’ve not cut out half the story to make the film – it’s a good length and once you’re engaged you can’t take your eyes away. Though nowhere near as well animated as A Christmas Carol, Polar Express is another essential family movie for Christmas. The kids will love it, though mine still get a little frightened when the little boy has to climb out on top of the train to rescue the golden ticket. It’s one of those real good old fashioned tales about belief, all symbolised by a tiny little bell that is given as a gift from Santa. Perfect Christmas Eve watching. This is fairly new film that I’ve watched a couple of times now and keeps growing on me. It’s basically the story of how Jack Frost discovers his origins and transforms from a selfish boy to a guardian of goodness. He joins forces with Santa, the Easter Bunny, the Sandman and the Tooth Fairy to battle against Jude law’s seriously sinister Pitch Black. There’s some excellent characters and heart-warming moments – especially as they all try to save Christmas. We loved this film. Three generations of Santa here and the geriatric one is definitely my favourite. However, the pompous heir to the sleigh is magnificently played by Hugh Lawrie. Unfortunately, his pomposity is not what we really need in a Santa and it’s his bumbling but good-hearted younger brother, Arthur Christmas, aided by his grandfather, who saves the day. A fun film where modern life comes a good second to traditional values. One of the pictures that always come to mind when I think of Christmas is of walking down a city street in the evening with all the Christmas lights on and the windows filled with fantastic displays. Miracle on 34th Street reminds me of that. The story is charming. Is the man with the beard who works as Santa in the department store really the real Santa? And what is the miracle? Short but beautiful. The Snowman is an awesome silent animation with a really atmospheric score that perfectly captures the season. It’s a modern day song of innocence and experience where a snowman comes to life and leads a little boy on the adventure of a lifetime. But snowmen, of course, are ephemeral, and soon melt away. Most UK readers will remember the song in the middle of the film, ‘Walking in the Air’, sung by a young Aled Jones. This film is just downright funny. Buddy the Elf is actually a fostered human who was mistakenly taken back to the North Pole by Santa. Unfortunately, he doesn’t fit in. He’s three times as big as everyone and very clumsy. After discovering he’s really a human, he sets off on adventure to find his real family back in New York – except of course, he has no idea about people and his ignorance of society leads him into all kinds of scrapes. However, his kind heart and faith in Santa are what saves the day. Kids will love this film. This is an animation of the Christmas story by ETA Hoffman which Tchaikovsky famously turned into a ballet. This version focuses closely on the story of the Nutcracker Prince who lives in a futuristic world until he is sent back in time by the evil Mouse King and turned into a wooden nutcracker. Back in time, he meets Clara who helps him turn back into a human and together they return to his home world. After lots of magical adventures, he wins the battle with the Mouse King to regain his rightful place. This is a really good children’s action and adventure story with a traditional story underpinning it. A warning here – this is either for families with teenage kids or for mums and dads to watch alone. It can be a little grown up in places, so if you don’t want your younger ones asking awkward questions wait till they have gone to bed. As a guide, if they still believe in Santa, it’s not for them! However, it’s one of my favourite Christmas films. A truly British classic. Exceptionally funny and romantic with the odd tear jerking moment here and there. Some excellent acting, an outstanding script and perfect for this time of year. Oh, yes, and it’s all about love, actually! If you think your family has some odd traditions at Chrsitmas, take a look at these 12 weird Christmas traditions from around the world. There are some quite fun ones here and some odd ones too. For some reasons shoes crop up a lot in various ways, but my favourite oddity has to be the strange ‘Caganer’ character Italians, Spaniards and Portuguese have in their nativity set. I wonder if they have these in the Vatican – doubt it? If anyone can let me know where this tradition began, please leave a comment at the end, I would love to know. One thing I’m thankful for is that I’m not having traditions Christmas in Greenland this year. Kiviak, as they call it is certainly not something I’d spend Christmas Eve dreaming of. If anyone has ever eaten Kiviak (and survivied) let us know what it was like. If you are looking for the best iPad alternatives for kids, here are my top reasonably priced tablet PCs for Christmas 2013. When choosing I’ve looked for exceptional value, low-cost, high specification and good customer reviews. You won’t be spending a lot of money here for something that is going to get dropped, spilled on and stood on, but you will get all the features that kids need in a tablet: gaming, apps, music, reading, internet surfing, taking photos & video and watching movies. With that in mind, here are 5 of the best kids’ tablets for Christmas 2013. For an exceptionally low-priced Android tablet, the 7″ Rapid 5 certainly comes with a lot of features. it uses a dual core cortex A7 processor which can run at 2x 1.5 GHz and has 4 GB of built-in storage which can be increased using a micro SD card. It has dual cameras and runs on Android Jelly Bean 4.2. Like all android devices you will be able to download and use all the apps from the Google Play store as well as sync it to any other Google service. Again, this is very inexpensive Android tablet that comes packed with hi-specification features. These include a 1.2 GHz dual core processor, IGB RAM/ 8GB Flash memory, 1024 x 600 resolution and HDMI output, besides the usual USB connector. It runs on JellyBean 4.2.2. It comes pre-installed with a range of apps, but all Android apps can be installed via the Play Store. For kids, this is a particularly good design as it has a rubber coating to protect it from those accidental drops which are bound to happen. Besides wi-fi, this tablet can also be connected via 3G using a dongle. For a high quality brand this 7″ tablet really is exceptional value for money. It runs on Android 4.1.2 Jelly Bean and has a 1.2 GHz dual-core processor with up to eight hours of battery life. Features include dual cameras, of much better quality than the products above, and a 1024 x 600 resolution screen which provides excellent picture quality. There is 8GB built-in storage with the capacity to increase this to 64GB with an SD card which means you can store lots of apps, music, movies and ebooks. Perfect for browsing the net, watching films or playing on apps and helping your kids with their reading. This is the wi-fi only version but there is also a 3G version available for an extra cost. The tablet also comes in a 10.1″ version. The more I see of the Amazon Kindle Fire, the more I am attracted to them. This is especially so for children’s use, because although they are a tablet PC, they are the quintessential book reader and for the many kids who seem to have developed an allergy to physical books, they are a perfect alternative that might just get them engaged. Book reader aside, Kindle Fire an exceptional piece of kit. Despite being less expensive, it has a higher resolution than the Samsung at 1280 x 800 and a faster processor at 1.5GHz. It also boasts excellent 3D graphics, Dolby audio, and features galore that you really need to visit Amazon to read about in full. For clumsy kids, the Kindle is made from materials that are 20 times stiffer and 30 times harder than plastic. The there is a wide range of Kindle Fire versions available including larger models. Once again, here is hi-spec, top brand tablet for a really reasonable price. Slightly larger than the rest of the models here at 7.9″, the Acer Ionica boasts a quad-core 1.2GHz Processor, 1GB RAM, 16GB memory (expandable to 32GB with SD card), Wi-fi, two cameras and the Android 4.2 Jelly Bean operating system. With a 1024 x 768 resolution, it’s the best of the Android devices for picture quality and only slightly less than the Kindle Fire. The cameras have a 5 MP resolution and there is also a mini HDMI connection. Lots of other features.